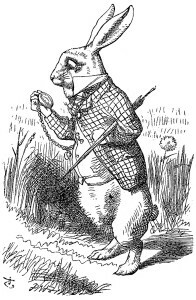 The world of quantum computing frequently seems as bizarre as the alternate realities created in Lewis Carroll’s masterpieces “Alice’s Adventures in Wonderland” and “Through the Looking-Glass”. Carroll (Charles Lutwidge Dodgson) was a well-respected mathematician and logician in addition to being a photographer and enigmatic author. 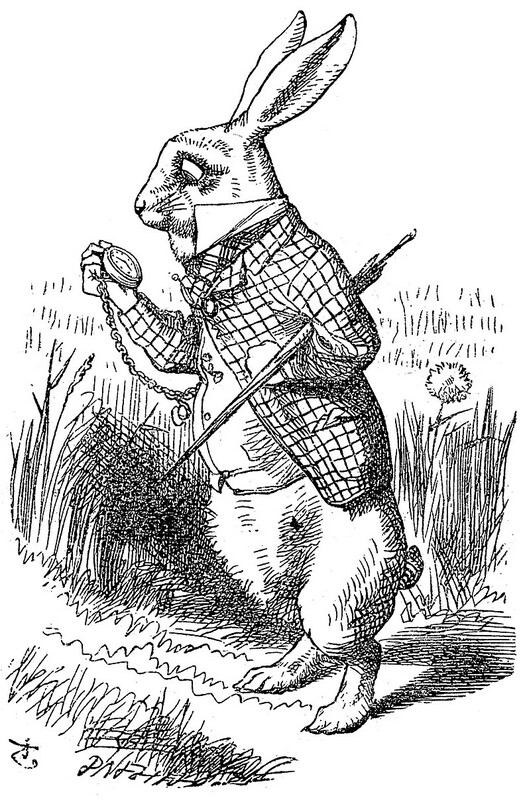 Has quantum computing’s time actually come or are we just chasing rabbits? That is probably a twenty million dollar question by the time a D-Wave 2X™ System has been installed and is in use by a team of researchers. Publicly disclosed installations currently include Lockheed Martin, NASA’s Ames Research Center and Los Alamos National Laboratory. 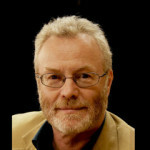 Hosted at NASA’s Ames Research Center in California, the Quantum Artificial Intelligence Laboratory (QuAIL) supports a collaborative effort among NASA, Google and the Universities Space Research Association (USRA) to explore the potential for quantum computers to tackle optimization problems that are difficult or impossible for traditional supercomputers to handle. Researchers on NASA’s QuAIL team are using the system to investigate areas where quantum algorithms might someday dramatically improve the agency’s ability to solve difficult optimization problems in aeronautics, Earth and space sciences, and space exploration. For Google the goal is to study how quantum computing might advance machine learning. The USRA manages access for researchers from around the world to share time on the system. D-Wave’s quantum annealing technology addresses optimization and probabilistic sampling problems by framing them as energy minimization problems and exploiting the properties of quantum physics to identify the most likely outcomes or as a probabilistic map of the solution landscape. Quantum annealer dynamics are dominated by paths through the mean field energy landscape that have the highest transition probabilities. 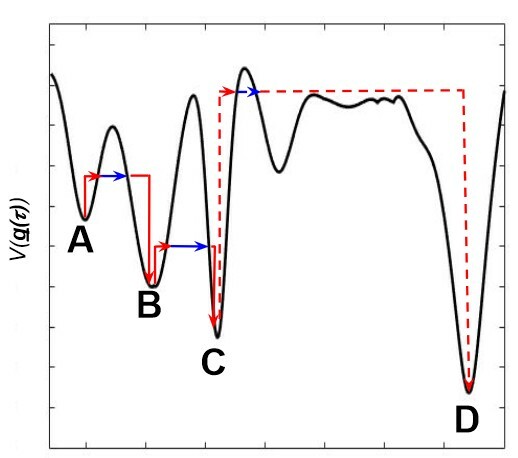 Figure 1 shows a path that connects local minimum A to local minimum D.
The D-Wave 2X: Interstellar Overdrive – How cool is that? As a research area, quantum computing is highly competitive, but if you want to buy a quantum computer then D-Wave Systems , founded in 1999, is the only game in town. Quantum computing is as promising as it is unproven. Quantum computing goes beyond Moore’s law since every quantum bit (qubit) doubles the computational power, similar to the famous wheat and chessboard problem. So the payoff is huge, even though it is expensive, unproven, and difficult to program. The advantage of quantum annealing machines is they are much simpler to build than gate-model quantum computing machines. 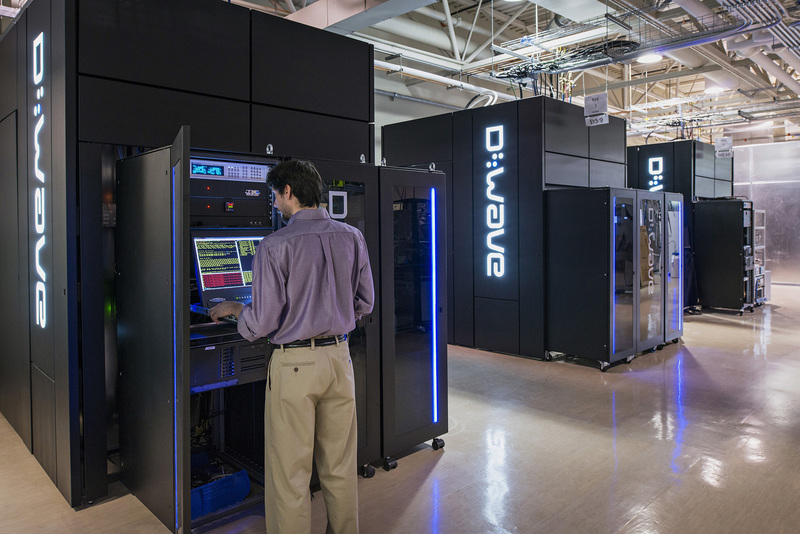 The latest D-Wave machine (the D-Wave 2X), installed at NASA Ames, is approximately twice as powerful (in a quantum, exponential sense) as the previous model at over 1,000 qubits (1,097). This compares with roughly 10 qubits for current gate-model quantum systems, so two orders of magnitude. It’s a question of scale, no simple task, and a unique achievement. Although quantum researchers initially questioned whether the D-Wave system even qualified as a quantum computer, albeit a subset of quantum computing architectures, that argument seems mostly settled and it is now generally accepted that quantum characteristics have been adequately demonstrated. In a D-Wave system, a coupled pair of qubits (quantum bits) demonstrate quantum entanglement (they influence each other), so that the entangled pair can be in any one of four states resulting from how the coupling and energy biases are programmed. 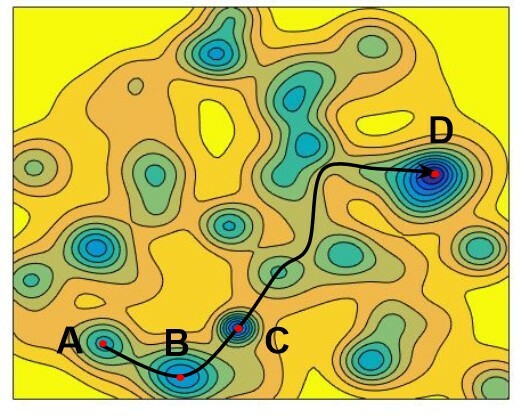 By representing the problem to be addressed as an energy map the most likely outcomes can be derived by identifying the lowest energy states. A lattice of approximately 1,000 tiny superconducting circuits (the qubits) is chilled close to absolute zero to deliver quantum effects. A user models a problem into a search for the lowest point in a vast energy landscape. The processor considers all possibilities simultaneously to determine the lowest energy required to form those relationships. Multiple solutions are returned to the user, scaled to show optimal answers, in an execution time of around 20 microseconds, practically instantaneously for all intents and purposes. The D-wave system cabinet – “The Fridge”– is a closed cycle dilution refrigerator. The superconducting processor itself generates no heat, but to operate reliably must be cooled to about 180 times colder than interstellar space, approximately 0.015° Kelvin. To function reliably, quantum computing systems require environments that are not only shielded from the Earth’s natural environment, but would be considered inhospitable to any known life form. A high vacuum is required, a pressure 10 billion times lower than atmospheric pressure, and shielded to 50,000 times less than Earth’s magnetic field. Not exactly a normal office, datacenter, or HPC facility environment. On the other hand, the self-contained “Fridge” and servers consume just 25kW of power (approximately the power draw of a single heavily populated standard rack) and about three orders of magnitude (1000 times) less power than the current number one system on the TOP500, including its cooling system. Perhaps a more significant consideration is that power demand is not anticipated to increase significantly as it scales to several thousands of qubits and beyond. In addition to doubling the number of qubits compared with the prior D-Wave system, the D-Wave 2X delivers lower noise in qubits and couples, delivering greater confidence in achieved results. So much for the pictures, what about the conversations? That of course, is where the conversations begin. It may depend upon the definition of “useful” and also a comparison between “conventional” systems and quantum computing approaches. Even the fastest supercomputer we can build using the most advanced traditional technologies can still only perform analysis by examining each possible solution serially, one solution at a time. This makes optimizing complex problems with a large number of variables and large data sets a very time consuming business. By comparison, once a problem has been suitably constructed for a quantum computer it can explore all the possible solutions at once and instantly identify the most likely outcomes. If we consider relative performance then we begin to have a simplistic basis for comparison, at least for execution times. The QuAIL system was benchmarked for the time required to find the optimal solution with 99% probability for different problem sizes up to 945 variables. 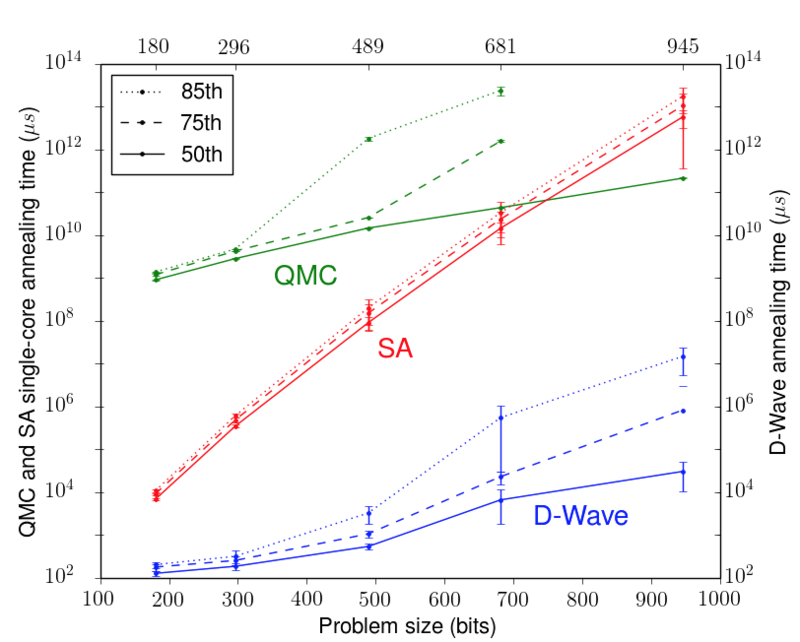 Simulated Annealing (SA), Quantum Monte Carlo (QMC) and the D-Wave 2X were compared. Full details are available in the paper referenced previously. Shown in the chart are the 50th, 75th and 85th percentiles over a set of 100 instances. The error bars represent 95% confidence intervals from bootstrapping. This experiment occupied millions of processor cores for several days to tune and run the classical algorithms for these benchmarks. 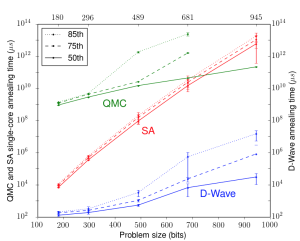 The runtimes for the higher quantiles for the larger problem sizes for QMC were not computed because the computational cost was too high. 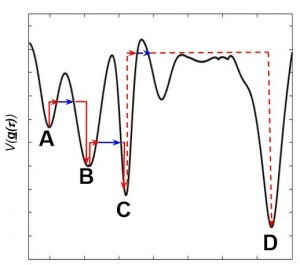 The results demonstrate a performance advantage to the quantum annealing approach by a factor of 100 million compared with simulated annealing running on a single state of the art processor core. By comparison the current leading system on the TOP500 has fewer than 6 million cores of any kind, implying a clear performance advantage for quantum annealing based on execution time. The challenge and the next step is to explore the mapping of real world problems to quantum machines and to improve the programming environments, which will no doubt take a significant amount of work and many conversations. New players will become more visible, early use cases and gaps will become better defined, new use cases will be identified, and a short stack will emerge to ease programming. This is reminiscent of the early days of computing or space flight. A quantum of solace for the TOP500: Size still matters. Even though we don’t expect to see viable exascale systems this decade, and quite likely not before the middle of the next, we won’t be seeing a Quantum500 anytime soon either. 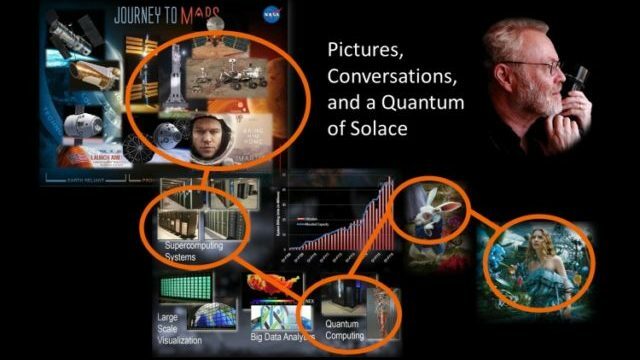 NASA talks about putting humans on Mars sometime in the 2030s and it isn’t unrealistic to think about practical quantum computing as being on a similar trajectory. Recent research at the University of New South Wales (UNSW) in Sidney, Australia demonstrated that it may be possible to create quantum computer chips that could store thousands, even millions of qubits on a single silicon processor chip leveraging conventional computer technology. Although the current D-Wave 2X system is a singular achievement it is still regarded as being relatively small to handle real world problems, and would benefit from getting beyond pairwise connectivity, but that isn’t really the point. It plays a significant role in research into areas such as vision systems, artificial intelligence and machine learning alongside its optimization capabilities. In the near term, we’ve got enough information and evidence to get the picture. It will be the conversations that become paramount with both conventional and quantum computing systems working together to develop better algorithms and expand the boundaries of knowledge and achievement. Richard, Good to hear from you. We should catch up sometime, I’d like to hear about Paramus and and what you have been up to since we last spoke. The AI work currently happening – such as the recent Go challenge – is fascinating, and can all be explored with current technology. On the other hand Google, Microsoft and others seem to find some value in exploring what can be done with quantum approaches for optimization, hence the allusion to the need for conversations. I don’t think anyone is suggesting that quantum approaches will replace other approaches in the foreseeable future, but rather that there is still much to be learned from all research into these areas, and there could be some benefit from cross fertilization. Thanks for taking an interest and responding. I would look forward to a chat sometime.